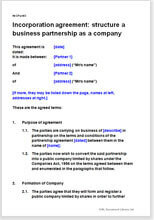 Company and partnership law requires that a business is transferred from one set up to anothert in a certain format, using very specific documents - this is the document you need to change your partnership to an Indian company. This essential document aids the formation of a Limited Company from an existing partnership business. Further, this document also sets the terms for the subsequent management of the new limited company. It is suitable for any partners in any business wanting to convert the existing partnership business into a Limited Company, and, or any person taking over an existing partnership business to run as a Limited Company. Protects the interests of all the parties.